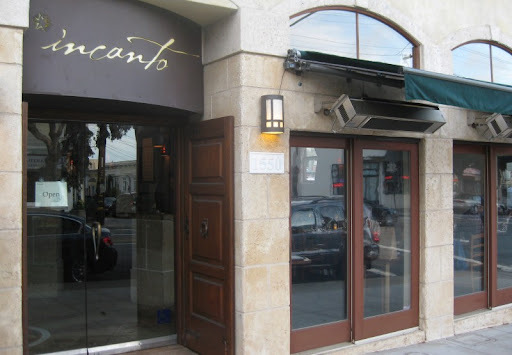 On one of the nights we spent recently in San Francisco, we hopped the J Church streetcar and escaped Union Square - heading out to the Noe Valley neighborhood for dinner at Chris Cosentino's restaurant, Incanto. Being big fans of pig parts served up in any and all forms, Incanto is a place we've been wanting to visit for a while now. In addition to Incanto, Chris and his business partner Mark Pastore run Boccalone, a salumeria located in the San Francisco Ferry Building. 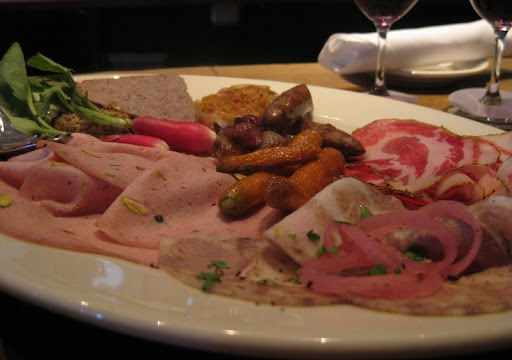 The antipasto platter is a selection of Boccalone meats along with some veggies. This incarnation had french country pâté, mortadella, capocollo, and coppa di testa, served with breakfast radishes and roasted carrots, shallots and garlic. 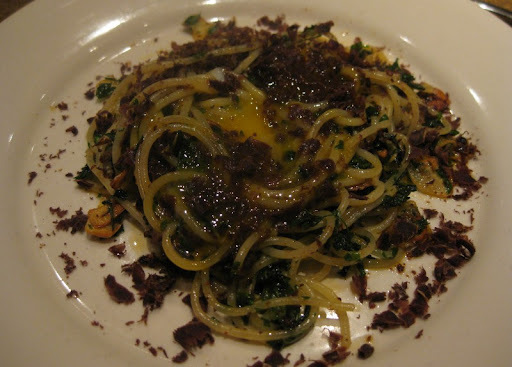 There was also a dollop of Boccalone's house-made mustard. The star of the show for us was the capocollo (they favor the Neapolitan spelling) - paper-thin slices of ruby-colored pork, striped with clean white fat. Beautiful and very, very tasty. We also really liked the mortadella - velvety textured, faintly aromatic with spices and studded with the occasional pistachio and peppercorn. It was probably the best rendition I've had. 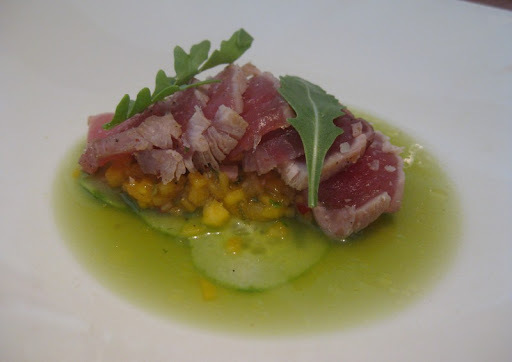 The only disappointment on the plate was the coppa di testa - a complete lack of seasoning prevented any of the flavors from coming through. On the balance, though, a very good dish. This was probably our favorite dish of the meal. The bites of calf's brains had a light, crisp coating and were nicely set up. 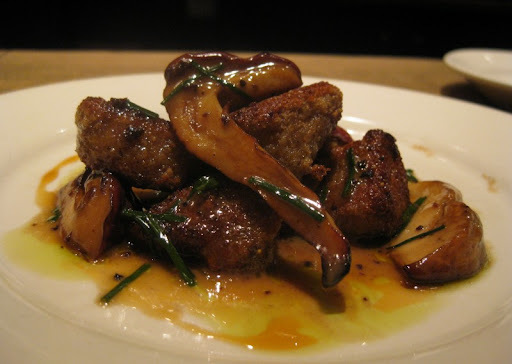 The porcini were quite mild in flavor, but were very visually appealing and had good texture. The complex sauce brought everything together. Our first brain experience, and definitely not our last. Sadly, this one was a clunker. The interior of the trotter cake had a pleasant gelatinous texture dotted with small bits of meat, but the expected porky flavor was muted due to a lack of seasoning and the outside of the cake was thick, gummy, and unpleasant. 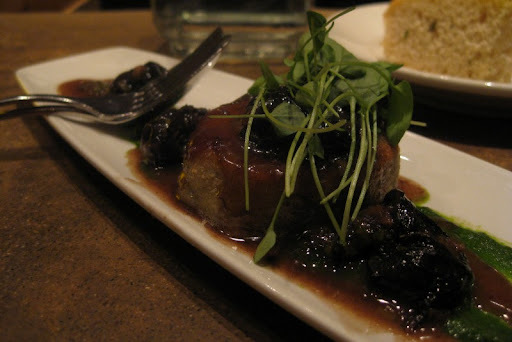 The snails dotting the plate were rubbery and neither the red wine nor the watercress sauce had much flavor. We really enjoyed our final selection of the evening - perfectly cooked pasta that was generously topped with deeply flavored shavings of salty, cured tuna heart. Nestled in the center was a fresh egg yolk waiting to be mixed through. 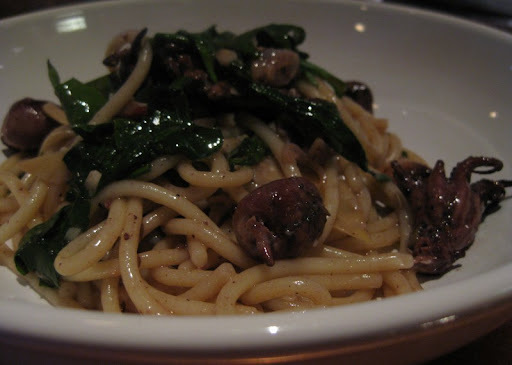 As a follow-up to the under-seasoned trotter dish, the salty flavor here was quite aggressive, and very welcome. Along with our food, we enjoyed several wines from their Italian-centric list - comprised of an interesting selection of regions and varietals that we don't often drink. Service (we sat at the bar) was friendly, pleasant and efficient - provided by the bartender who also ventured out as sommelier for the rest of the restaurant. Overall, a very enjoyable if somewhat flawed meal. Providing an ever-changing menu with a nose-to-tail focus is, I am sure, something that is difficult to execute consistently. 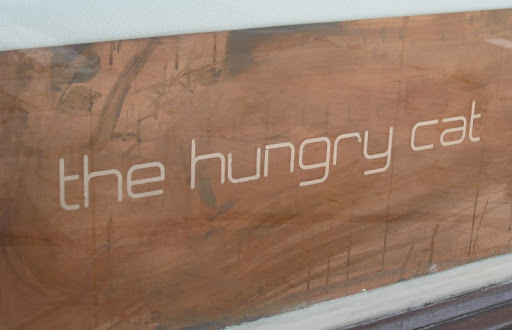 The promise of an exciting new dish is well worth the risk of having a poor one, however. We definitely plan to eat here again. We suddenly broke into clear blue sky as we headed over the golden gate bridge out of an overcast San Francisco. 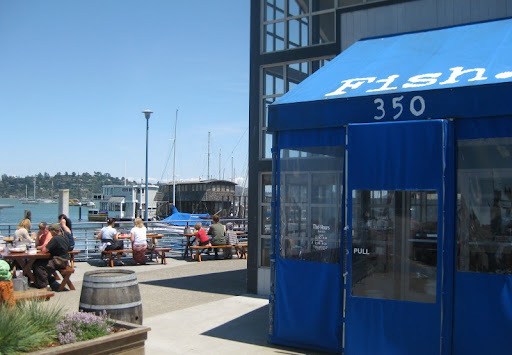 It was perfect weather for lunch along the water in Sausalito, so we stopped in at Fish. Fish, as you might expect, specializes in seafood. The place is casual, but given the location and their emphasis on sustainability, the food isn't cheap. 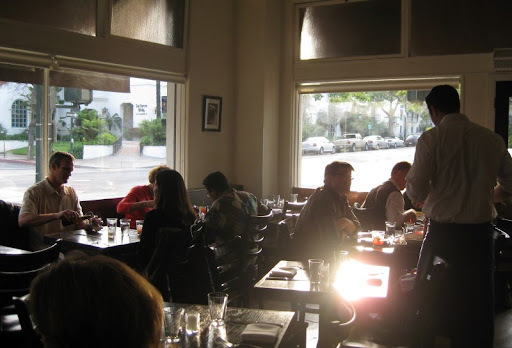 Tax is included in the prices, however, and since you order at the counter gratuity is tip-jar style. 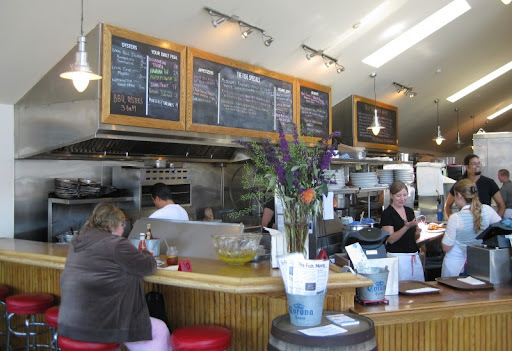 The menu has a selection of permanent offerings - chowders, fish & chips, sandwiches - as well as a daily selection of several fish that can be served as your choice of salad, pasta or on an Acme roll. 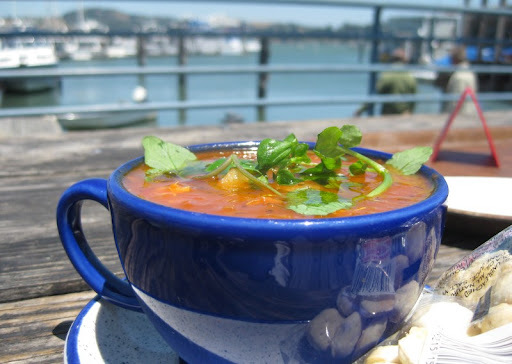 If they had just called it a tomato-herb soup, I would have been completely satisfied. 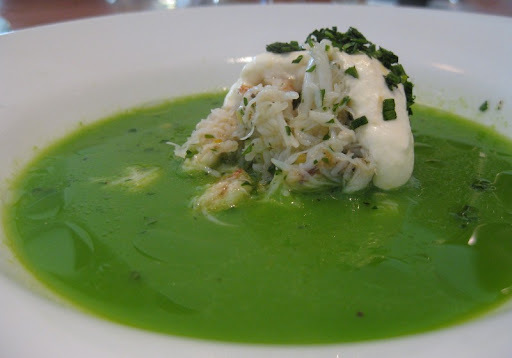 As a "chowder", however, it was a bit lacking - giving short shrift to seafood flavor. Nevertheless, it was still very good. I forgot to ask what fish were used, but their were at least two, and maybe three. 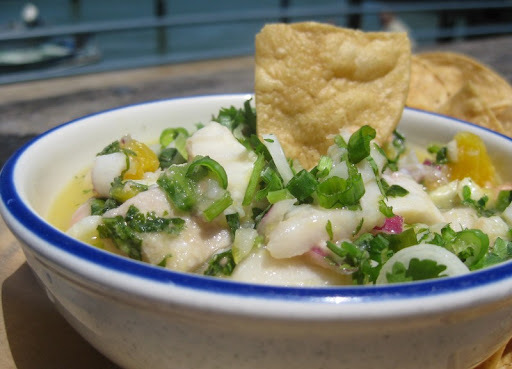 We guessed halibut and tilapia. The marinade was an orange base, and fairly sweet. While I think I prefer the more standard lime/lemon as the citrus it was a nicely done and a fun change. The fish wasn't firmed up quite as much as I like, but it tasted wonderful and fresh. It was generous portion of both sardines and salad. 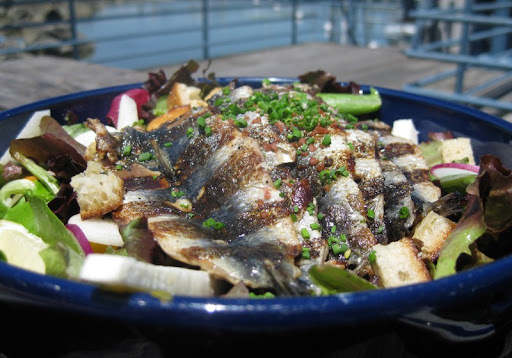 The sardines were great - nicely butterflied and grilled, and the salad was sparingly dressed with oil and vinegar just the way I like it. Lovely day, great location, very nice meal. Highly recommended. 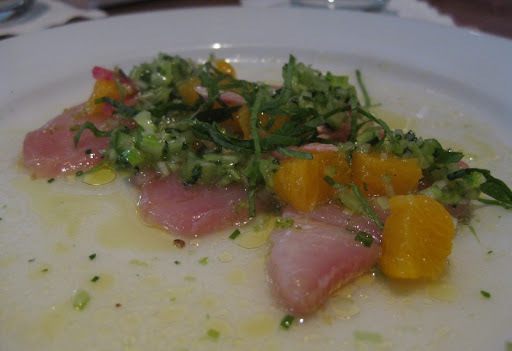 While The Hungry Cat provided our best food in Santa Barbara, we had other nice meals as well. 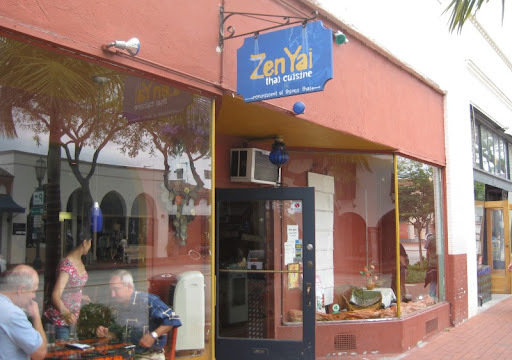 We had a surprisingly good Thai dinner at Zen Yai - a little place right on State Street (pictured above during lunch service the next day). We started with their papaya salad, which was nicely done and had a decent heat level. Then we had an eggplant/chile/basil dish with chicken. I can be mixed on eggplant, but this was very nicely cooked. We also had their "Massaman Salmon". Generous chunks of crispy salmon in a rich, flavorful sauce. 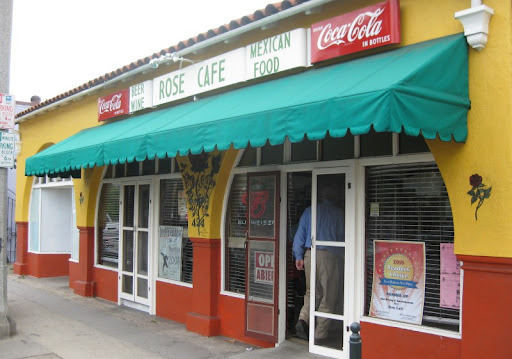 On our way out of town, we stopped for late breakfast / early lunch at the Rose Cafe, a Mexican greasy spoon a few blocks east of State Street. When we arrived, a few people were finishing up breakfast, and some older gentleman were enjoying coffee and a newspaper at the counter. Definitely a neighborhood joint. I had huevos rancheros and Sherry had a pork burrito and a chile relleno. Everything was good - nothing particularly special, but quite enjoyable. Combined with friendly service and the nice local feel to the place, it makes a good casual breakfast or lunch option in the area. On Tuesday afternoons and Saturday mornings, they shut down two blocks of State Street for a farmers market. 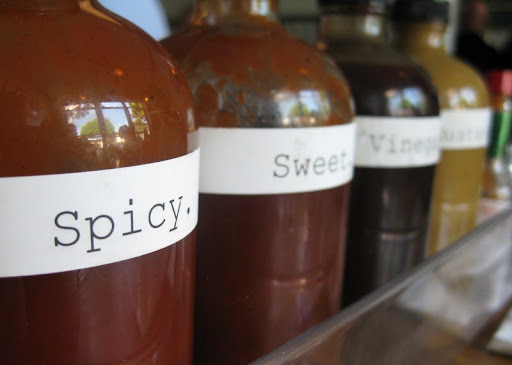 We happened to be in town for the Tuesday market and took a stroll down the line of booths. We immediately had farmers market envy. While we love our local farmers market, the Santa Barbara market was pretty impressive in comparison - with easily twice as many vendors. 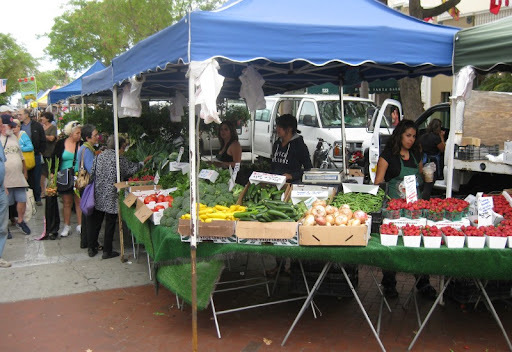 Like our market, it is all farm-produced products - nobody selling jewelry or snacks on a stick. Truly a great resource for those living in the area. We're off on a quick road trip up the coast - ambling along at a nice leisurely pace. The first leg of our trip was just a couple of hours north to Seal Beach, a little community just south of Long Beach. We immediately liked the place - it reminded us a lot of our own neighborhood in Pacific Beach. 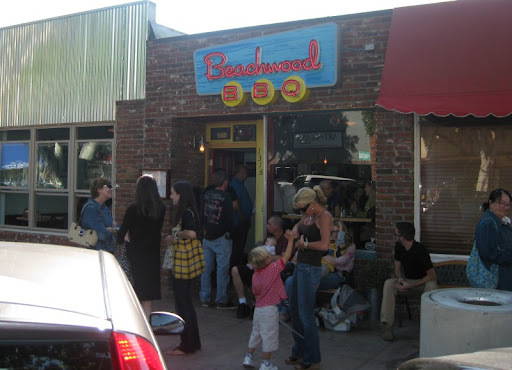 Our destination in town was Beachwood BBQ, a place known for passable barbecue (hey, that's a compliment in Southern California...) and one of the better selection of craft beers in the greater L.A. / Orange County area. 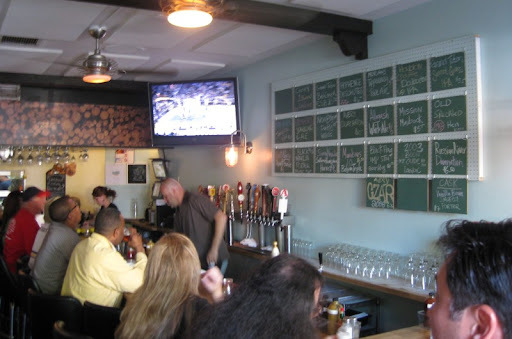 The place is pretty small, and is split into two sections: a bar area and a separate seating area with 10 or so small tables. We generally prefer to sit at the bar, but it was 5:00 on a Sunday and the place was packed - we had to wait a bit for a table. The crowd in the dining area was decidedly food and not beer focused, with the demographic being largely families with kids and older couples. 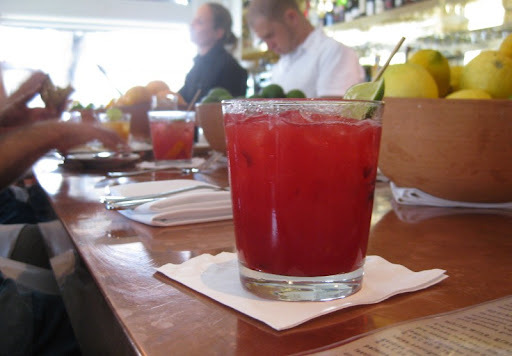 After an appetizer and some drinks, we left for a while and came back later to sit at the bar. Much better. On the beer front, our visit to Beachwood was definitely a success. After trying the Deschutes Hop Henge (which we quite liked) we moved on to some Belgian selections - the Houblon Chouffe Dobblen IPA Tripel (a favorite of ours) and the Maredsous Triple 10. The Chouffe was very nice, as usual, but the star of the evening was the Maredsous. It poured with a beautiful, creamy head that lingered nicely. Although a bit maltier than what I think of as typical for the style, I thought it worked really well. We had an order of the bbq chicken nachos, which we quite liked - a good sized portion of smoked chicken with some nice guac and salsa. We were intrigued by their "fish sticks" (made with cold smoked ling cod), but they were just ok. The fish had some smoke flavor, but overall was under seasoned and didn't really grab us. Ditto the fried green tomato salad - fine, but fairly bland. 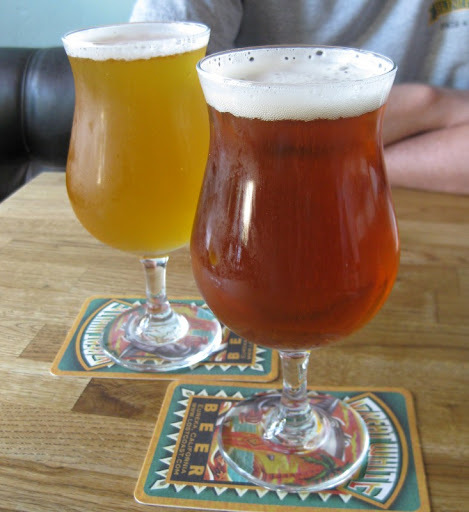 Beachwood is definitely an oasis in the craft beer desert north of Camp Pendleton, and certainly a worthy destination. 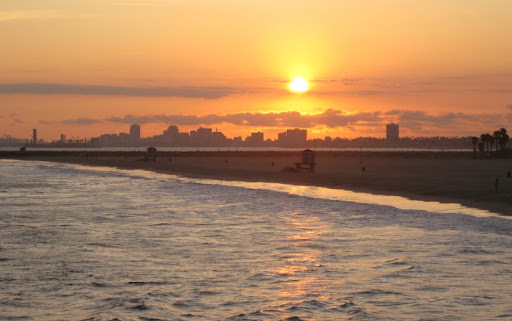 Between our two separate stints at Beachwood, we took a sunset stroll on the Seal Beach pier. The view looking north was a fascinating contrast between the serenity of surf and sand, and the industrial and urban sprawl of the Long Beach harbor and skyline.